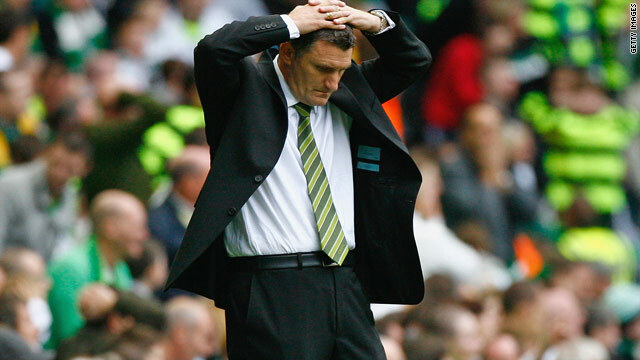 Tony Mowbray has paid the price for a string of poor results at Celtic this season. (CNN) -- Tony Mowbray has been sacked as manager of Scottish Premier League giants Celtic following a string of disappointing results this season. The decision follows Celtic's 4-0 defeat at lowly St Mirren on Wednesday, which left the club 10 points behind Rangers at the top of the table -- with their Glasgow rivals also having two games in hand on Celtic. Mowbray was appointed manager of Celtic in succession to Gordon Strachan last June, despite overseeing West Bromwich Albion's relegation from the English Premier League last season. But, despite advocating an open attacking style of play, Mowbray has been unable to translate stylish football into winning results, with Wednesday's defeat Celtic's 13th of the season. We are all Celtic supporters and are all disappointed at the way things have gone this season. Assistant manager Mark Venus and first team coach Peter Grant have also departed the club. However, another coach, Neil Lennon, has been retained and has been named caretaker manager for the rest of the season. In a statement on the club's official Web site, Celtic chairman John Reid said: "On behalf of the board and everyone at Celtic Football Club, I would like to offer Tony Mowbray my thanks and best wishes for the future. "Tony is held in great affection by Celtic fans and it is obviously with great disappointment that we make today's statement. During his period here, Tony has always acted with great dignity as he has done today. "We are all Celtic supporters and are all very disappointed at the way things have gone this season."